Darlings, run don't walk to the show up now at the Gagosian Gallery at 522 West 21st Street on the late work of Claude Monet. It's there until June 26th and it's a beautiful thing. A year ago Mr. Gagosian mounted a show on the late work of Pablo Picasso. Hats off to the gallerist for bringing these shows to the public, free of charge. 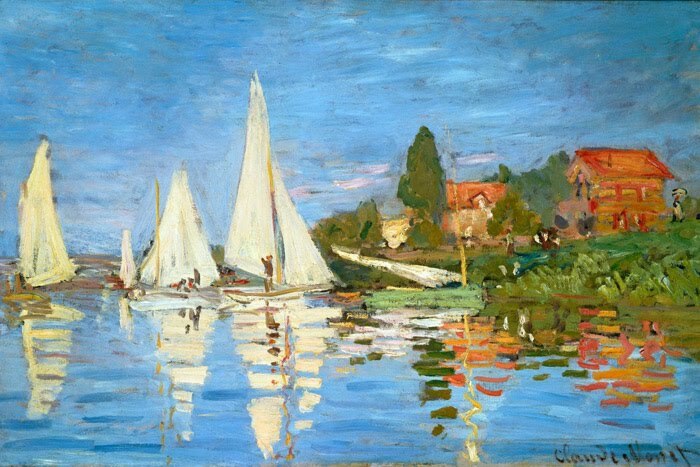 Off course you know that French Impressionist Claude Monet (1840-1926) created some of the most poetic and idyllic paintings in Western culture. 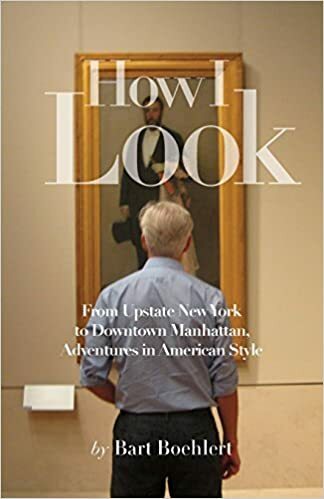 This show focuses on the end of his career when he was enjoying some prosperity, and had bought the house and gardens in Giverny which would inspire and comfort him. He turned his attention to the gardens and the water gardens for subjects, and created his meditative, transporting water lily paintings. 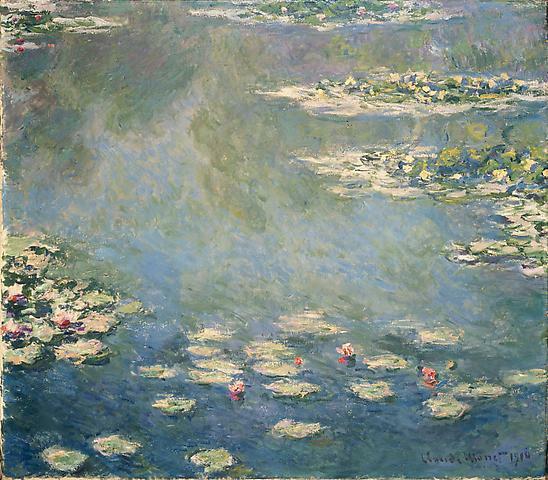 You may remember when Jane and I visited his famous Water Lily series at the Museum of Modern Art. At the Gagosian, the paintings are hung in four rooms. The gallery has very high ceilings and openings of light that imitate sky lights. It's like being in a very modern church. My favorite paintings were light and sunny. Green, blue, pink and olive green swirl together suggesting reflection and water depth in this painting from 1907. This take from 1908 was more greenish, suggesting a bright day. 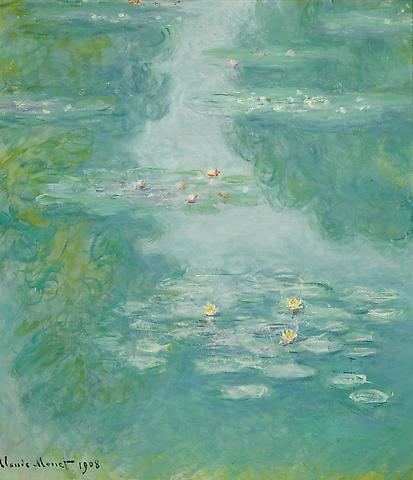 One painting of water lilies from 1916-1919 featured pink lilies that looked like fat roses floating on light green leaves in a pond of light blue water. Dark green tendrils of weeping willows hung down the sides. What a vision. Claude Monet once said, "I perhaps owe becoming a painter to flowers." 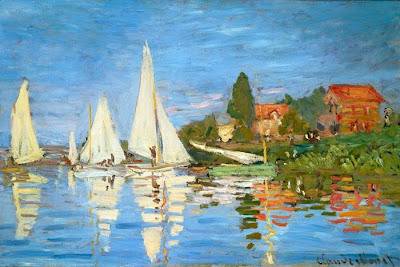 I have long been drawn to the work of Claude Monet. When I first arrived at college at McGill University and even before I became an art history major I bought myself in the college bookstore a poster of this painting by Monet. It's titled The Regatta at Argenteuill from 1872. I loved it's buoyant, cheerful colors. The brushstroke streaks of pink and orange reflection in the water just made me happy. and Monet's Table which includes recipes, for he and his wife were renowned entertainers. 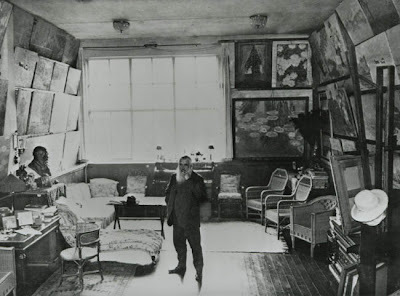 The house at Giverny included a big studio where Monet painted. Here is the old man now. I like the wicker furniture, the polished wood floor and the paintings hung high up on the walls. 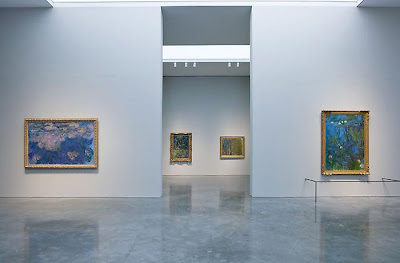 Isn't it fun to think of Monet painting here some of the works now on display at the Gagosian Gallery. Oh my Bart, I so wish I could be there!